Today I have another revised section of the chapter of my Civil War and Gettysburg that I posted yesterday. This one deals with the subject of the Emancipation Proclamation, and it’s importance as the first step to the long process of bringing equality to African Americans. I’m sure that like everything that I will continue to revise the section too, but I hope that you find the complicated political dynamics of the story both interesting and enlightening. I think tomorrow I will post the following section which deals with the process of recruiting newly free African Americans into the military, a process that has led to unlimited opportunities for Blacks in the military. The Civil War brought about another change to warfare in America. This was a societal and political change that has shaped American military history, culture and life ever since. 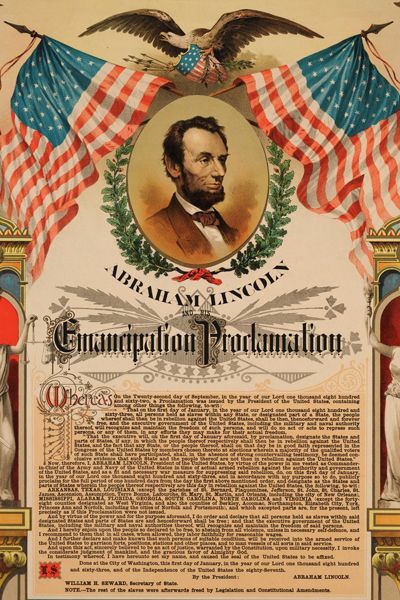 The Emancipation Proclamation gave African Americans, both Freedmen and recently freed slaves the opportunity to serve in the Union Army. The change of policy instituted by Lincoln was revolutionary as well as controversial and it had strategic implications for the war effort. There were many doubters in the north whose attitudes towards African Americans were not much different than Southerners, especially among the Copperheads. Prior to the Emancipation some Union commanders in occupied Confederate territory “had unofficially recruited black soldiers in Kansas and in occupied portions of South Carolina and Louisiana in 1862. But the administration had not sanctioned these activities.”  The issue for Lincoln in 1861 and 1862 was the necessity of keeping the Border-Slave Sates of Kentucky, Missouri and Maryland, which had not seceded from the Union. Lincoln repudiated the orders of General John Fremont, in Missouri, and his friend General David Hunter, who commanded the Department of the South regarding emancipation, not because he was in complete disagreement, but because he felt that the officers had overstepped their authority. Salmon Chase and other strong abolitionists opposed Lincoln vehemently for this, but it would not be long until Lincoln made the decision for emancipation. This was first accomplished by the Emancipation Proclamation, a military order that only applied to the states that had seceded. However, Lincoln would follow this by pushing for a constitutional amendment to end slavery. The latter occurred when Congress passed the Thirteenth Amendment was passed in January 1865. This amendment abolished slavery in the United States. But Lincoln remained firm in his conviction due to the need to ensure the cooperation of the Border States the continued loyalty of which were absolutely vital to winning the war, without which no meaningful emancipation would be possible. However, following the defeat of McClellan on the Peninsula he decided to postpone announcing it, Secretary of State Seward recommended against it until “until you can give it to the country supported by military success.” Otherwise the world might view it as an incitement for slave insurrections, “as the last measure of an exhausted government, a cry for help…our last shriek, on the retreat.”  The wisdom of Seward’s advice was profound, and Lincoln noted, “The wisdom of the view of the Secretary of State struck me with great force…. It was an aspect of the case that, in all my thought on the subject, I had entirely overlooked.”  Thus the President put off the announcement until the repulse of Robert E. Lee’s invasion of the North after the Battle of Antietam.